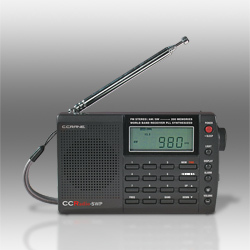 The C. Crane CCRadio-SWP is a very small portable shortwave radio with excellent shortwave and mediumwave performance for a radio in its price class. Runs 70 hours on 2 “AA” size batteries (not included). This entry was posted in C Crane, Portables and tagged C. Crane, C. Crane CCRadio-SWP, CCRadio-SWP, Ultralight. Bookmark the permalink.